In the spirit of both Eastern and Western traditions, Dr. David Simon shows how changing our mindset from commandment to personal commitment can help us make the life transformations we want and need. We were raised on the Ten CommandmentsÑand unfortunately most of us use the philosophy of "thou shalt not" (eat too much, drink too much, work too hard, etc.) to command ourselves to change. Dr. Simon encourages us to embrace the power of commitment to create a life of greater peace, vitality, love and purpose. Through commitment to be authentic, love more openly, embrace abundance and relax, we can translate our desires into actions that bring about transformation and healing. "In this fascinating and uniquely insightful book, David explores the core tenets of Western spiritual values and demonstrates how, with a subtle yet powerful shift in perception, the essential truths of East and West merge to create a compelling vision for a better world." "Written by one of the most brilliant thinkers of our times, The Ten Commitments will take you on an irresistible journey of awakening, providing tangible steps for translating ideas into action and desires into results." You are reading these words because there is something in your life you would like to change. It may be something you want to relinquish but are afraid to let go. It may be something you are longing for but have been unable to manifest. WeÆre here together to help translate your intentions into choices. This requires the power of commitment. Commitment is a contract between your body, mind and soul. Your body has needs. Your mind has desires. Beyond the immediacy of your physical cravings and your emotional longings is your soul, encouraging you to make the choices that are most likely to bring enduring peace of mind. It is whispering these words to you: ôI want you to be happy,ö ôI want you to be healthy,ö ôI want you to have love,ö ôI want you to live a life of meaning and purpose.ö It may be difficult to hear these life-celebrating messages from the depths of your being if your mind is turbulent and your body is in distress. Although it is usually taken for granted that people know what the words ôbody, mind and soulö mean, IÆd like to offer my definitions, which IÆll be using throughout the book. Your body is the collection of molecules that enables you to experience the world. It includes the sensory equipment that connects you to your environment (hearing, feeling, seeing, tasting and smelling) and the motor systems that enable you to act upon the world (your vocal apparatus, hands and feet). Each day you metabolize sensory experiences through the everchanging chemistry and electricity of your nervous system, which in turn influences every cell and organ in your body. Through this process, your experiences become your biology. Your mind is a field of thoughts, engaging in a continuous conversation about what has happened, what is happening and what might happen to you. In response to your perpetual experiences, you make discriminations, evaluations and judgments, colored by emotional reactions. Your thoughts, memories, desires and feelings are various expressions of your mind. Your soul is the silent witness to your mind and body. Your body is changingùyou only need look at a photograph from a decade ago to see that your body today is different from what it was in the past. Your mind is changingùyour beliefs about yourself and the world are different now compared to earlier times in your life. Underlying this dimension of change is your quietly observing soul, providing continuity to your identity. When your observing soul, thought-generating mind and physical body are aligned, you are most likely to translate your intentions into choices that result in the desired outcome. Commitment implies action. When you make a commitment, you dedicate yourself to a course of action that you believe will result in the expansion of happiness and wellbeing. The fulfillment of a commitment is realized when your intentions become your automatic style of functioning in the world. If you make a commitment to enhance your physical fitness, your commitment yields its fruits when you find yourself looking forward to your exercise time or your healthy meal. The fulfillment of your commitment to stop smoking manifests when you lose the desire to light a cigarette. Commitment means moving through a door of change through which you do not intend to return. Responsible parents devote much of their child-rearing energy to setting boundaries. As soon as children are capable of making choices, parents begin the eighteen-plus-year process of instilling commandments intended to keep them safe and functional in society. ôDo this . . . donÆt do that . . .ö are the developmental tools applied to shape our outer boundaries, defining what is and is not appropriate and acceptable. In response to the imposition of external limits, children struggle to set internal boundaries, which appears as resistance to being told what to do. By about two years of age children learn to assert their independence through use of the powerful word ôNo!ö Practiced relentlessly, the talent for resisting authority is honed during teenage years. The process of maturing into adulthood requires, in large part, the development of skills to camouflage resistance to parents, teachers, bosses, doctors, clergy, policemen and other authority figures whose approval or support we need. Authority figures may change, proscriptions may change, but the deep desire to control our own lives remains. Since tribal times, societal elders have attempted to reinforce rules by enlisting the power of the gods. If the human complications of lying, cheating or stealing are not enough to discourage you, the fear of divine wrath may be persuasive. If the likelihood of causing pain among family members is inadequate to avoid adultery, then the possibility of basting in hell may convince you. Moral codes are designed to protect individuals and communities from unnecessary suffering; nevertheless, reinforcing demands with fear is as likely to provoke resistance as it does to invoke acquiescence. The Ten Commandments are the moral guideposts of our Judeo-Christian society. As the underlying precepts of order in our Western world, they have guided our ethical choices for millennia. They offer a powerful prescription for moral health, and if being told how to behave resulted in people doing what was ultimately good for them, the world would be a much better place. Unfortunately, it is one thing to be commanded; it is another to make conscious choices that serve the greatest good. We are commanded not to kill, but over sixteen thousand people are murdered each year in the United States, and in the name of God or country, tens of thousands are killed in armed conflicts. We are commanded not to steal, but over ten million thefts occur annually. We have a prohibition against adultery, yet studies suggest that at least half of married people engage in extramarital affairs. Treated as children, people respond as children. It is time to replace commandment with commitment. Your parents were writing the opening lines to the screenplay of your life by the time you arrived onstage, and for much of your existence you have been reading from the script you were handed. If your story is unfolding as you hoped it would as a child, you have probably intuitively implemented the principles of this book. You are among the fortunate ones who have learned to commit consciously to your dreams until they manifest. If, however, deep in your soul, you suspect that you have not yet realized your full potential and are worthy of more, then this book is for you. The Ten Commitments is for people willing to become the change they want to see. It is for those who can embrace the idea that free will is the greatest gift to humanity, and that despite what has happened up until now, we are capable of writing a better next chapter. Albert Einstein defined insanity as ôdoing the same thing over and over again and expecting different results.ö The Ten Commitments is offered as a guide to sanity. There is value in understanding how you arrived at your present situation. Chronic emotional and physical health concerns can reflect early discord. Seeing the connection may be beneficial, as long as you do not add insult to injury by taking on too much responsibility for a condition that has other important factors outside your control. Knowing your father was ill-tempered may help gain insight into your irritable bowel syndrome. Acknowledging that your mother was emotionally remote may help you understand your eating disorder or anxiety attacks. Honestly looking at your past can be helpful in appreciating the current condition in which you find yourself. At times, it can even be liberating. However, life is short, and spending years trying to ôget to the bottom of the problemö may not be the most successful strategy. It is possible to understand clearly why you are unhappy, but still not be any happier. It is possible to know why you have made bad choices in the past, but this knowledge may not enable you to make better ones now. The most important principle of healing and transformation is: For our lives to change, we have to change. There is a skill in charting the course of your life that requires finesse and timing. Seeing the bigger picture and making more conscious choices is a path of power and subtlety. It requires clarity of purpose and purity of intention. It requires commitment. Although human beings have the capacity to make choices, most people live their lives as conditioned as Pavlovian dogs, reacting in predictable ways to the situations, circumstances and people they encounter. Because there is security in doing things the same way over and over, people stay in relationships that do not nourish them, hold on to jobs that provide limited outlet for their creativity and maintain daily routines that numb them to the miracles unfolding around them in every moment of life. Admit it. You are a creature of habit. You awaken at about the same time every day, use the same toothpaste and eat the same breakfast. You drive to work along the same route, listen to the same radio stations and arrive at the office at about the same time. When you get home you watch the same television shows, go through the same evening ablutions and get to bed at about the same time. A private investigator keeping track of your patterns for a week could predict where you would be at a given time on a given day with a high degree of accuracy. This is the conditioned human experience. There is no reason to change your patterns if you are getting what you need out of life. But if you recognize the need to release inhibiting habits in pursuit of greater happiness, love, well-being and meaning in your life, commitment is the proven path. The premise of a commandment is that without threat, direct or implied, a desired behavior will not occur, as in, ôIf you donÆt clean up your room, youÆre not going to the party!ö ChildrenÆs behavior may be temporarily controlled through commandments. Genuine and enduring healing and transformation in adults can only occur through commitment. I recently spoke on the Ten Commitments to a group that included members of the clergy. A few protested when I suggested that the Ten Commandments were insufficient. They asserted that the ômassesö need to be treated like children and that the Ten Commandments have successfully kept people in line for millennia. I could not confidently disagree with their interpretation of past collective needs, but I am convinced that for humanity to survive and thrive, we must assume personal responsibility for our choices. It is my hope that this new language for our old precepts will create a new reality. Repeatedly affirming something seldom leads to lasting change. Successful people do not continuously tell themselves, ôI am a powerful person.ö Physically fit people do not perpetually remind themselves, ôI can control my eating.ö Emotionally secure people do not constantly affirm, ôI am a confident person.ö Lasting benefits rarely result from affirmations alone. 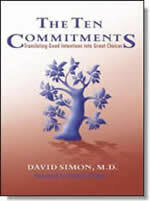 Benefits derive from behaviors; behaviors derive from commitment. What do you want? Are you prepared to take the steps to get it? In The Ten Commitments we will explore how to make good choices, not out of fear of being caught or punished, but because they reflect the person you really want to beùthe sacred being you sense you are. As a result, the quiet voice of your soul that wants you to be happy, know love, feel vital, and have meaning and purpose in life will find its expression. David Simon, M.D., (San Diego, CA) has been instrumental in forging a new model of health that integrates body, mind, and spirit. As cofounder (with Deepak Chopra) and medical director of the Chopra Center, Dr. Simon is the driving force behind the Center's development, training, and implementation of programs and seminars in mind-body medicine, emotional healing, and spirituality. He directs a comprehensive curriculum that includes on-site seminars and workshops, in addition to a worldwide educational outreach program.